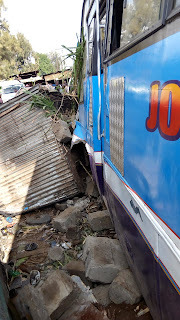 Home MTAANI NEWS Scores escape death by a whisker as Joy Kenya bus rams garage. 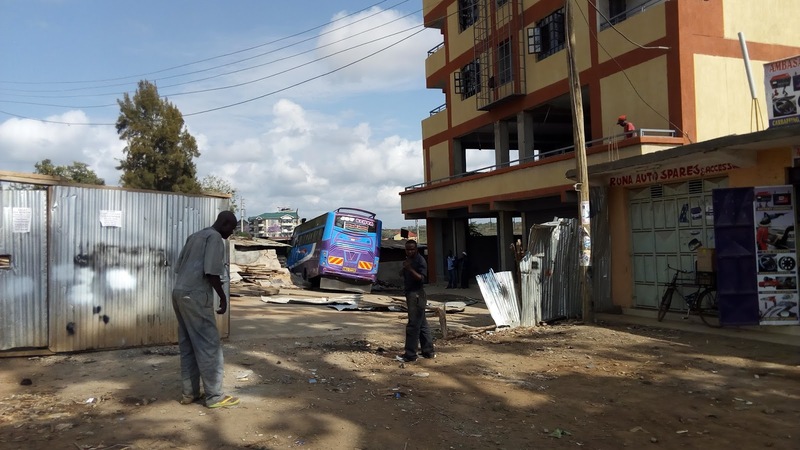 Scores escape death by a whisker as Joy Kenya bus rams garage. 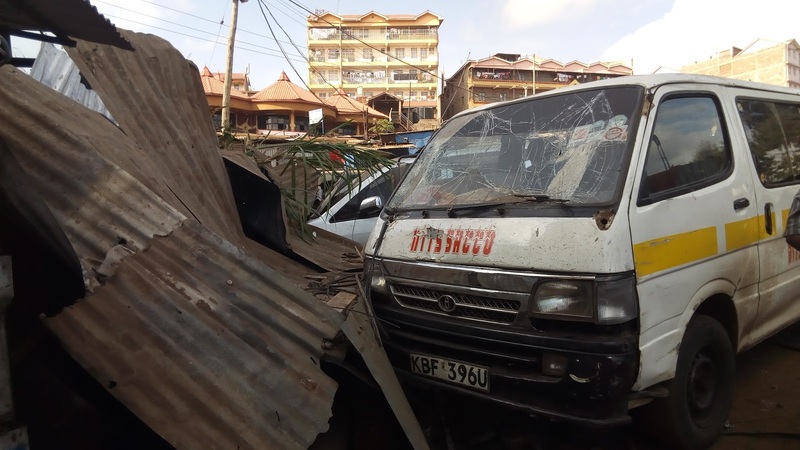 About six people have their gods to thank when a commercial bus veered off the road and ploughed into a garage near Nanasi Hotel in Thika Town on Mashujaa Day. According to eyewitness account, the bus belonging to Joy Kenya Ltd. was coming downhill from the main bus station when it suddenly lost control probably because of brake failure and failed to negotiate the sharp corner, smashed into a mabati fence surrounding a building under construction before it rammed onto the garage concrete wall and onto a few structures. Thankfully, no life was lost nor anyone hurt in the horrific incident that occurred in the morning hours. However, three vehicles and other property were destroyed in the accident. One of the lucky survivors, a mechanic, had just got off from under the Toyota Hiace matatu he was repairing to pick a tool when all over sudden the bus smashed the wall, sending the debris over the three vehicles that included the 14-seater matatu. The visibly shaken young man could not talk to the press but instead just thanked God for the narrow escape. His colleague was in one of the shops that were destroyed. He says that he heard screams from the adjacent building and mechanics who were just seated along the road and he managed to dash out in the nick of time. He admitted that the garage wall and some construction material placed next to the wall from the neighbouring building saved them as it them that suspended the bus, stalling further movement and imminent danger. All in all, majority of those we talked to admitted that the bus driver courageously controlled the bus for more than 300metres on a steep slope, avoiding to hit a tree, several structures and the 6-story building under construction before ending up at the garage wall. “Were it not for him, we would be narrating a different story by now. He has done all he could to control that bus otherwise we would be talking about several deaths by now,” said Njuguna Mwaniki, a mechanic at the site. He reckoned that the area is a black spot and has been experiencing so many cases of vehicles ramming into buildings or other vehicles. “We are lucky there were no vehicles coming from the opposite direction especially at that sharp bend,” he said. He also admitted that majority of mechanics plying their trade in the area risked their lives as most of them repaired vehicles along the edges of the road. “Surely, it’s only God who is protecting these people because if this accident happened when the garage was busy, we would be talking of more than ten people dead by now,” he noted.